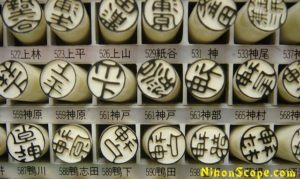 Hanko stamps (判子) or otherwise known as Han or Inkan are stone, horn, wood or rubber stamps that are created with the individuals name on the bottom of it. It’s basically a signature that we westerns are familiar with. 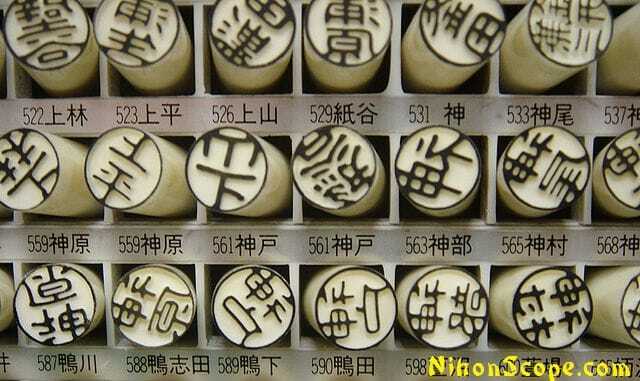 They are used practically every single day in Japan by most people and are used to stamp a letter, or purchase a car. The history of the hanko is a bit different, they came to Japan from China but were only available to people of top authority officials usually in government. It took almost 1,000 years after they arrived for the general population to finally be able to use these hanko stamps, but interestingly enough the general population of Japan was not allowed to have any type of myouji (surname/family name) until about the late nineteeth century. Hanko stamps in general date back to 5500 B.C., where it first made it’s appearance in the Middle East as personal symbols being engraved on stones, shells, clay and wood. It’s started because of similar reasons a cattle farmer wants to brand their live stock, people used to use these stamps to identify their personal property. These hanko then found themselves inside Europe, then they finally hit into Asia. At this current point the oldest hanko in existence in Japan is made of gold as was given to the Emperor Guangwu of China back in 57 A.D. Han Dynasty. The seal was given to a king who ruled in a city near where Fukuoka is today as acknowledgement of his status. Japanese government authorities began to use these hanko for official documentation for authentication around the eight century and since then the Hanko has been also used by high governing officials and even samurai for most of Japan’s recorded history. They were common also amongst merchants and even farmers in the Edo period (1603-1868). The current hanko system was really started amongst the Meiji Era (1868-1912), finally in the early 1870’s the government passed a law that required people to register their personal hanko that will be used for important legal and personal documents. Perhaps you’ve seen some of these red seals on papers in gift shops or on a painting before? 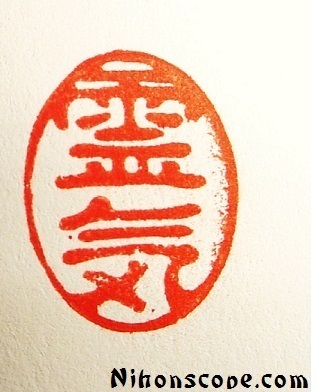 But it’s not just for paintings and crafts, the hanko stamp is used to sign for things as well in Japan. Instead of simply signing your name over and over again the people of Japan will stamp their way to a cramp free hand. These hanko (or just han) stamps are in the hands of every single person in Japan, it’s quiet normal, although as a western it is odd that I’ve seen these stamps, yet most people have no clue that these are used in daily life to this very day in Japan. When people order the hanko stamps their price is determined by 3 things: shape, size and material. Some are stone, some are rubber and some are made of wood and some sadly are still made from ivory. The size is then determined by how complex it is based of the use of characters. When hanko are made they are made simply for your last name, as in Japan they always use their myouji (Surname) first instead of their first name. There are hanko that do have both, but in Japan most people will not used it unless there is a certain occasion like purchasing a house. It said that average Japanese do not even have a first and last name hanko, and if they do they might use it 1 or 2 times in their entire lifetime. When it comes to westerns using hanko it’s good to note and be aware that there aren’t Kanji that can exactly pronounce your name (most times), with that said, you’ll be using the next best thing which is pronunciations that are close enough to do the job. On other note, some names in English and in other languages have actual meanings, so perhaps your name is “Brook”, there are a set of Kanji to describe a Brook and thusly you’ll have your hanko based off of those kanji instead of the pronunciation. There is also 2 different shapes of hanko, round and a square. It’s good to note that if you are buying this for yourself, you’ll want to purchase a round hanko as it’s used by individuals whereas square hanko are used by organization. Although artists will use the square hanko for their artworks. Another interesting note is that in Japan people of a certain class, such as a PhD do not add that they are a Doctor or Sensei to their hanko or signatures, it’s seen in Japan as a sign of insecurity to have to tell people you are who you are. If you were to do this for yourself being a foreigner, you’d just be viewed as culturally ignorant. It’s said that people who are confident and accomplished do not need to tell others that they are. In Japan people judge this type of ‘self proclamation’. As a foreigner you can use a hanko for some legal documents but not all. Many times a signature is still required, like if you were to buy a car, or a house, you will no doubt need a signature to do so. BUT, if you wanted to go the extra mile you would register your hanko with the government.